So, we finally finished the big project that we’ve been working on for a while. 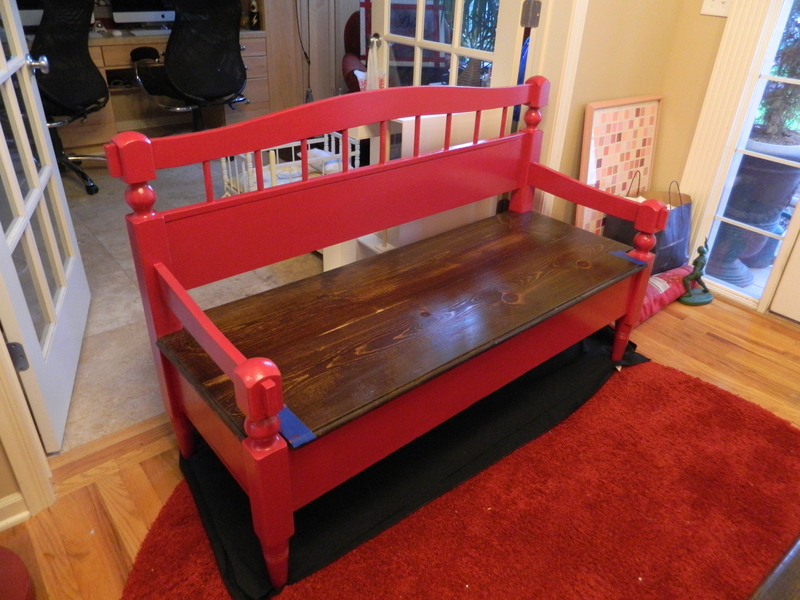 I think this one took so long because I really don’t want to let go of these benches…. I think I was looking for a way to keep them while we were working on them; it would explain why I was ‘dragging my feet’ on them. It is what I would envision for my kitchen, if I had more of a country kitchen. Even so, I think they could work in my kitchen if I didn’t already have a dining room set that I am in love with. Sometimes I wish I could have two kitchens. We did away with the formal dining room in our house almost from the day we moved in (we had the open formal dining room closed with french doors and made into my home office), so I don’t have the room for a second dining room set. And the area that it resides in just off the kitchen is too small to accomodate anything other than the round dining room table. Sigh. 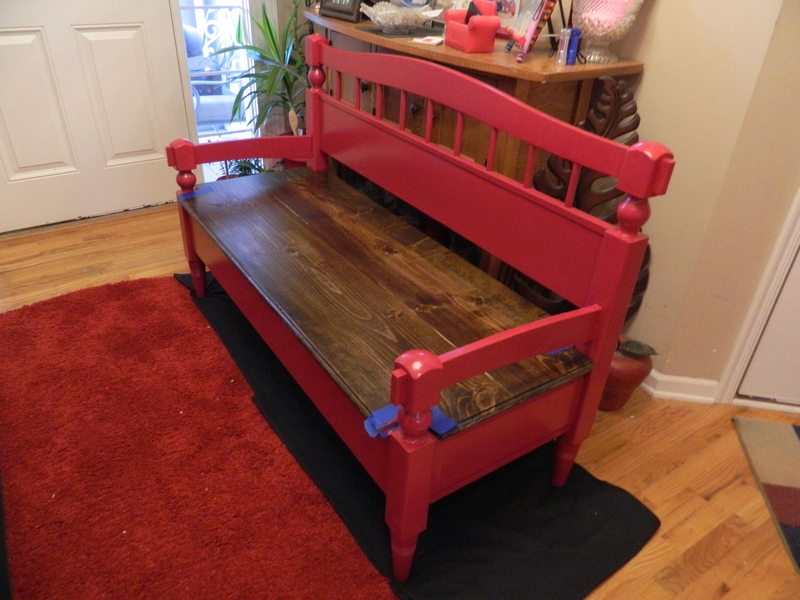 A while back, I finally took the step of transforming a head- and foot- board set into a bench. 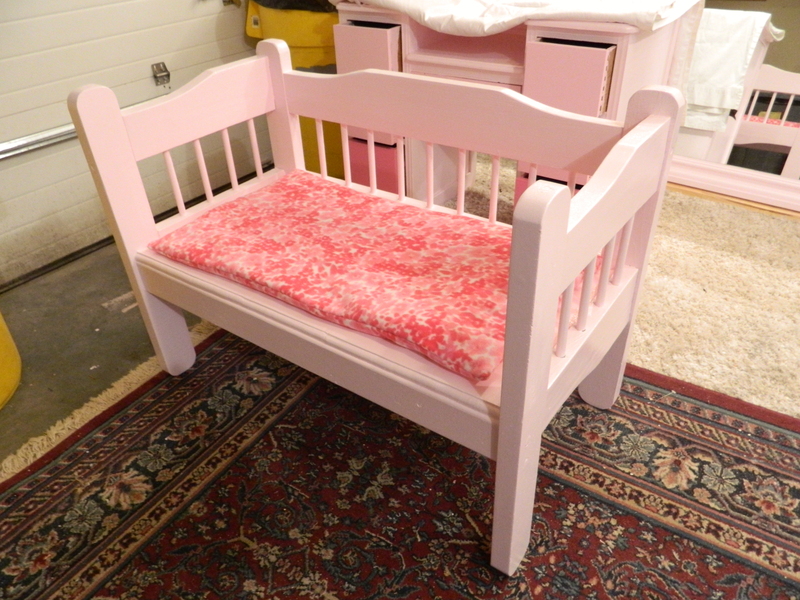 It was a small, cute little bench perfect for a little girl’s room… like a reading nook where one could curl up with a favorite teddy bear or doll and a book and be happy. That experiment turned out pretty well (at least I think so) and it sold really fast. The only thing I didn’t like was that the seat was too deep, IMHO, such that an adult couldn’t sit comfortably in it. But in the end, it really was designed for a smaller book reader or readers. 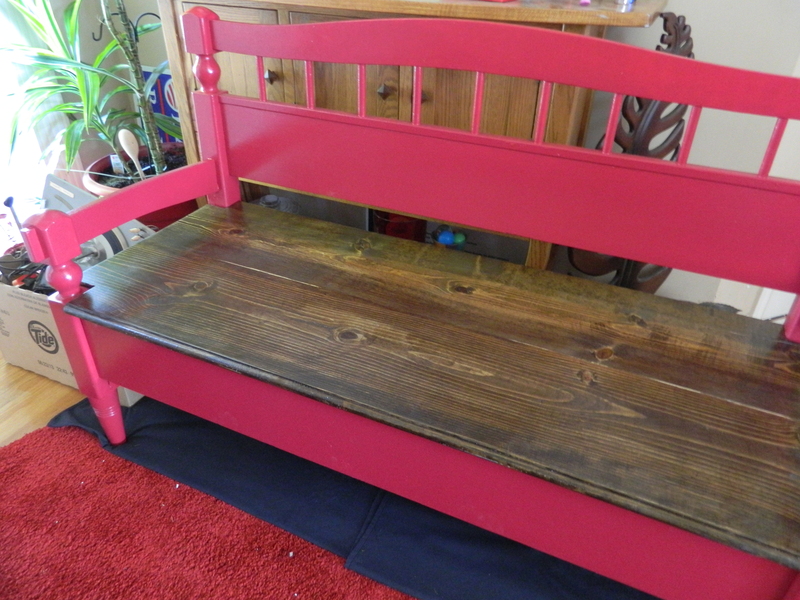 If I had made this to keep, I would have added a thick foam seat upholstered in a nice long wearing fabric. Fast forward to today. I did the final touch ups last night (which explains the blue tape in some of the photos). Today we moved them into the foyer to allow more room for new projects; I already have two more projects underway! Okay, where to begin. 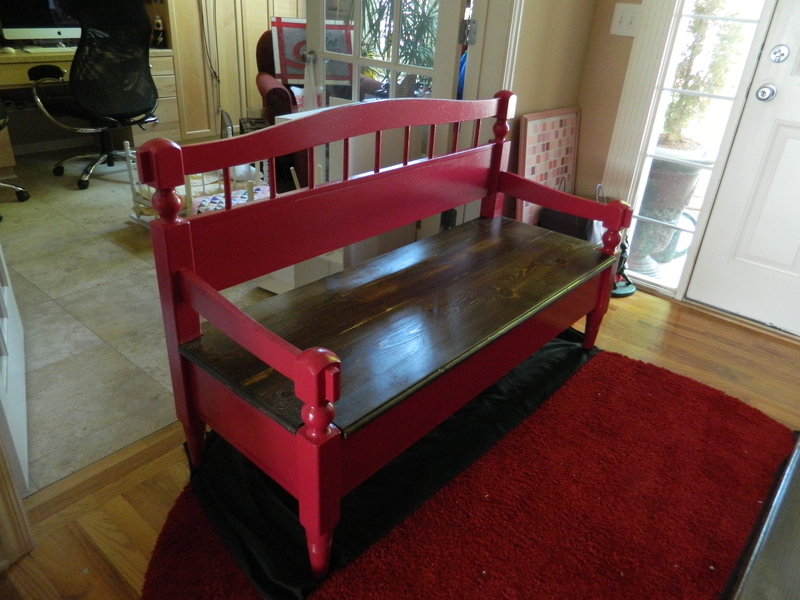 It is a pretty straightforward task of taking the head- and foot-boards and turning them into benches. Sawing the foot-boards in half and then placing each one on either end of the head-board. Actually, learning the lesson from the previous bench construction, I realized that I needed to pay attention to the depth of the bench. It was my intention to make them benches to be used, perhaps at a big old country table, replacing individual chairs on either side. Using one of my dining room chairs as a guideline, I marked from each end of the foot-board 16″ and then made the cuts. 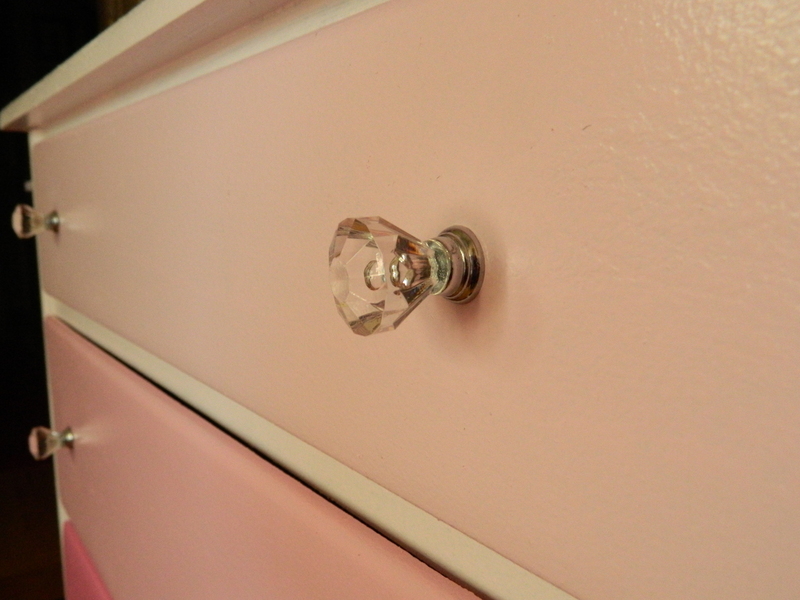 Each piece was then attached to the legs of the head-board. Our choice of construction is to drill through the leg and into the cut half, this seems the most solid method. We also added quarter round to add a little more strength. Then a board is cut (we used 1″x8″ pine) and attached to both ends of the foot-boards. It was at this time we noticed something different between the two benches. Do you see it? I’ll let you in on the secret at the end, if you don’t figure out while reading this post. Next up was to attach a similar board to the back between the legs and then we measured and cut the seats. 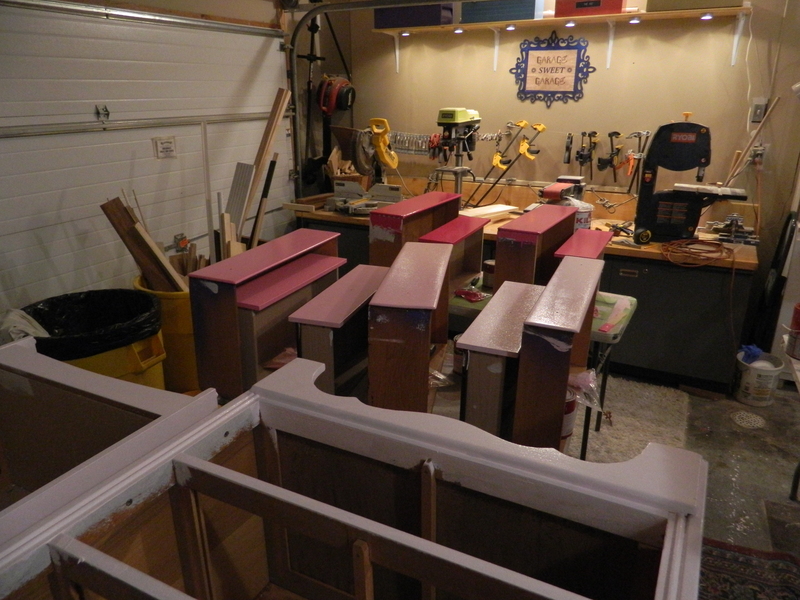 I knew from the start that I wanted to stain the seats, so we did not permanently attach the seats at this time. 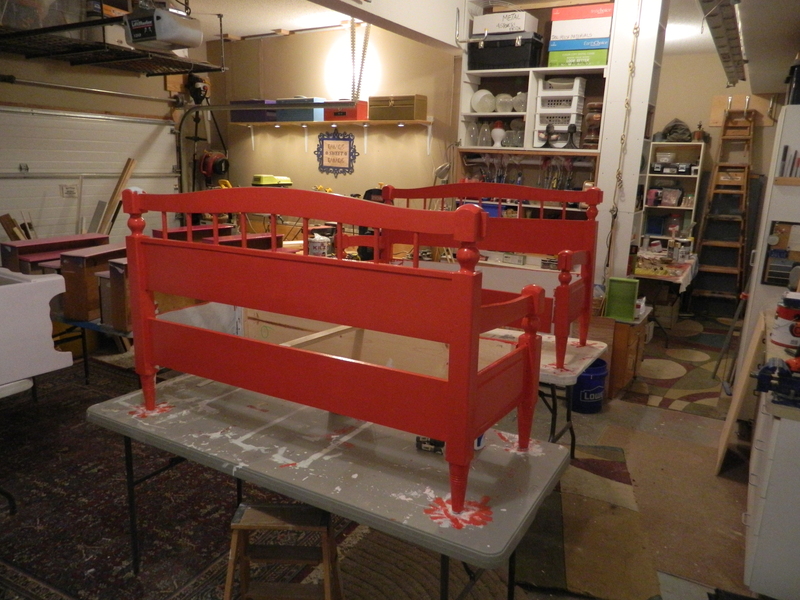 Both benches were then primed (I bought a primer and had Home Depot tint it red, the idea to make painting take less coats of paint. It helped, but not quite as much as I hoped. 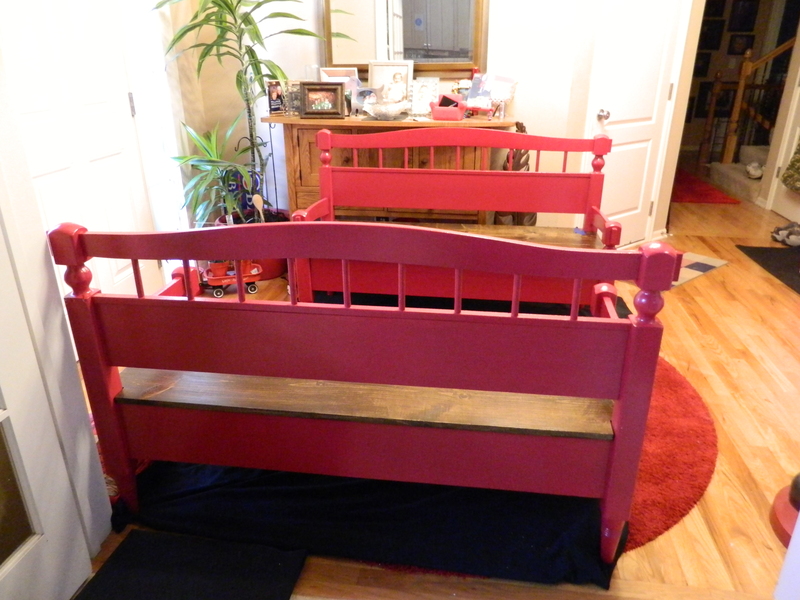 There was still five coats of paint applied! 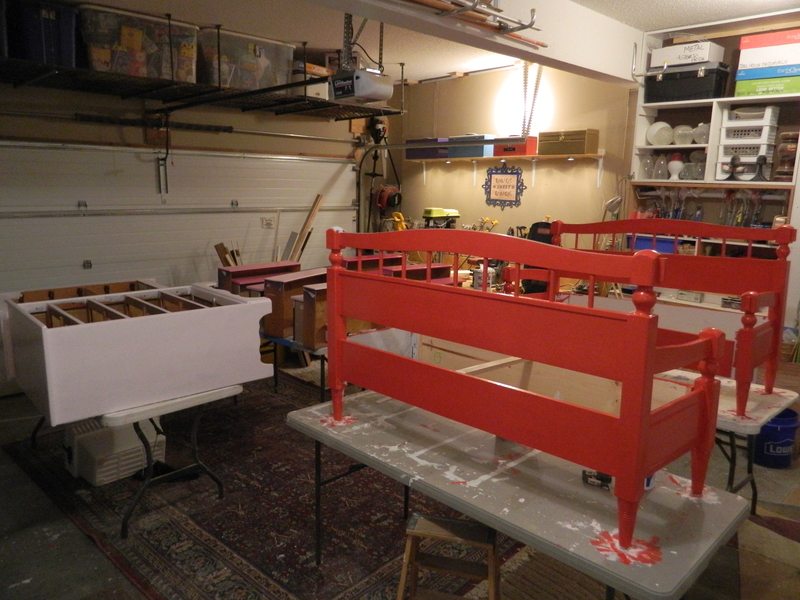 Red is a bear of a color to work with, but I think it is well worth it. 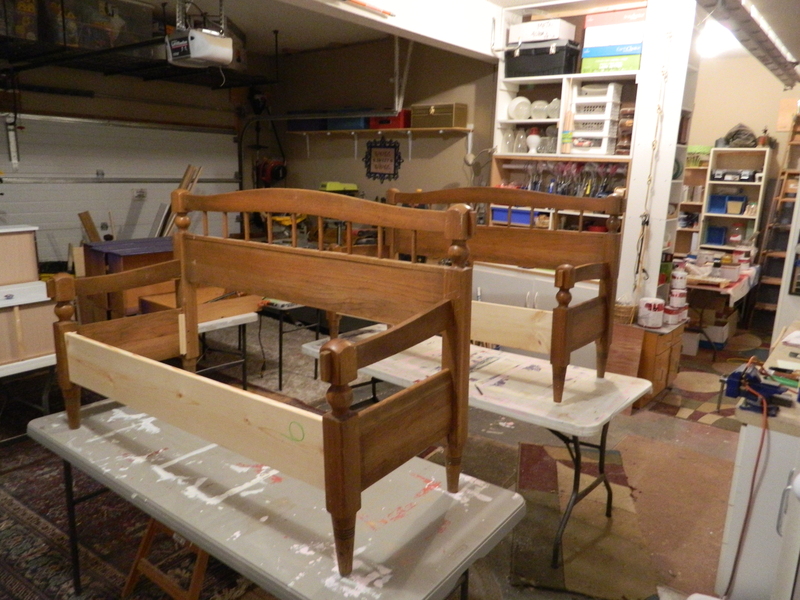 The bench seats are in the forefront, I had spent this particular day sanding and edging and preparing to stain the wood that would become the seats. I think sanding is my least favorite thing to do. Necessary? Absolutely yes. Fun? Nope. 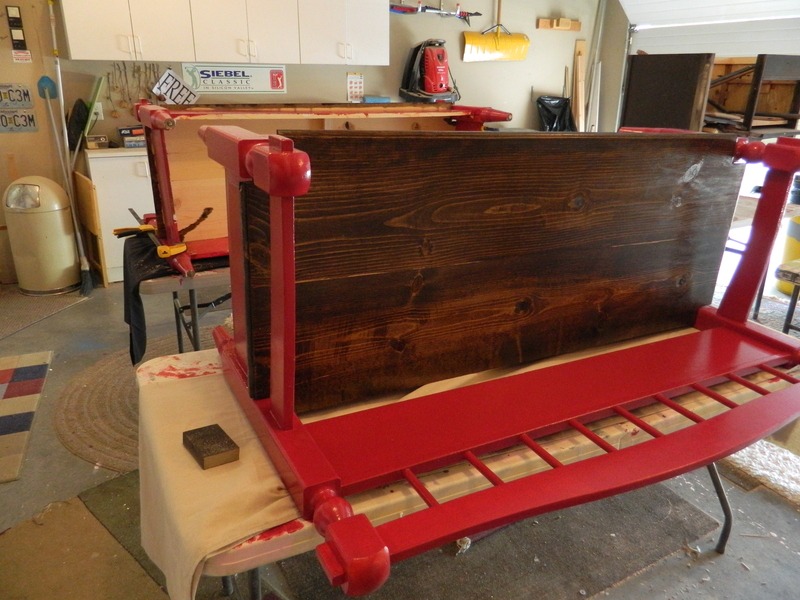 The seats were then given three coats of stain with a light sanding in between, followed by three coats of high gloss polyurethane (also with light sanding in between). Whew! That’s a lot of sanding! The Kid really, really doesn’t like to sand, so I make deals with him about what he can do while I sand. Time to assemble; the way this is designed, the seat just sits on the four bases but is not attached in any way. I think this makes it a little more maneuverable, in the event of an uneven floor or if it is to be used outdoors. Also means that there is less stress on any of the joints, which is always good. 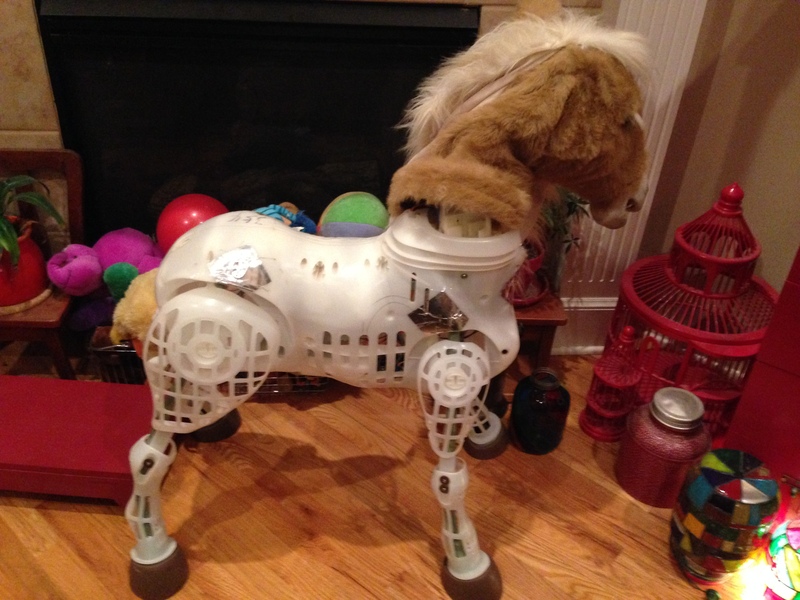 For me and The Kid, these projects have almost become rote. However, we thoroughly enjoy all of the projects we undertake, though; especially me getting to spend time with my about-to-be-twenty year old son. 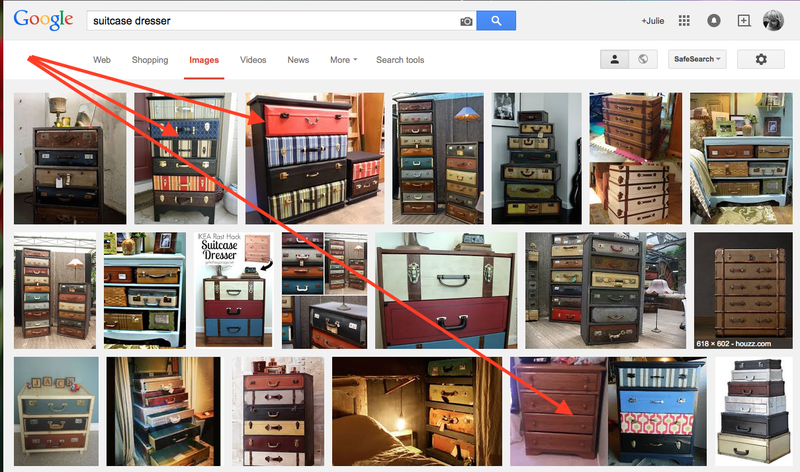 A few of the pictures show a little blue painter’s tape… that was done to make a few touch ups. Its amazing how different lighting can make you see something you missed the first time through! Have you noticed the little difference between the two benches yet? We only noticed it just late enough that we couldn’t change it. 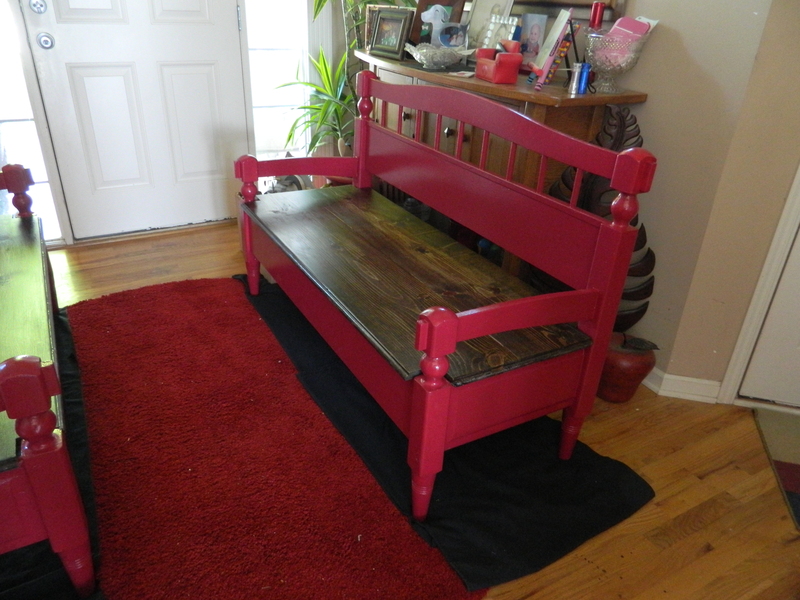 Or, I suppose we could have, but we thought it would be fun to have something just a little different between the two benches. I think the foot board must have come apart at one time and when it was repaired, it was replaced upside down. A little extra charm! 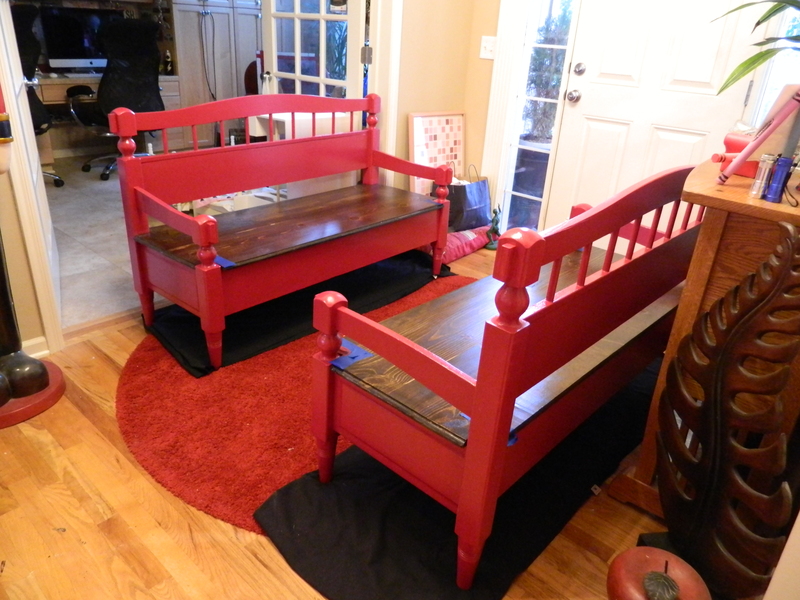 I thought long and hard about making a table to go with these benches. And pick up a couple of similar, but not exactly the same, chairs for the head and foot of the table. Paint it all up to match. Seemed like a bit too much investment right now, though, see if they sell or not. Maybe if someone asks, we can take it to the next stage. The weather is finally started to feel like spring and it makes working in the garage so much easier. We might have to take some time over the next few weeks to get back into my strawberry beds: weeding and planting additional plants. We also have to get someone to dig out a large hole in the backyard so that we can dump the equivalent of three 55 gallon barrels of compost under the garden bed. The Kid has some definite ideas about what he wants to plant this year. So, I hope you enjoyed today’s reveal. We’ve already got lots more to share! Just a Normal Sunday… Right?!? So, I managed to find some get-up-and-go and brought my current projects just a bit closer to ‘done’. 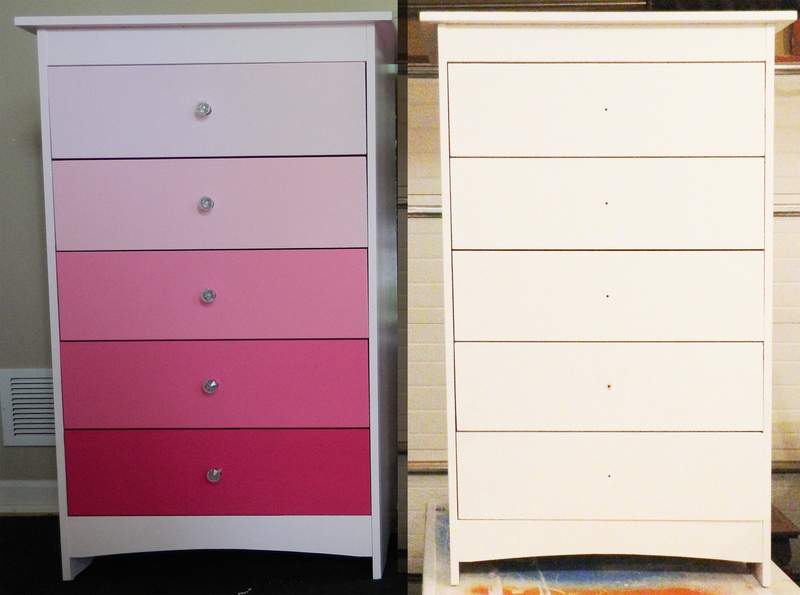 First up are two dressers getting the standard pink ombré treatment. 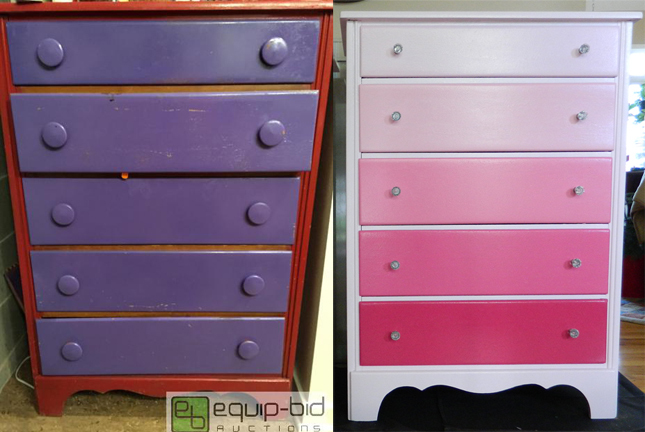 Both are five drawer chests of drawers, I love when I get five drawers, that gives me the chance to paint with six different shades of pink! 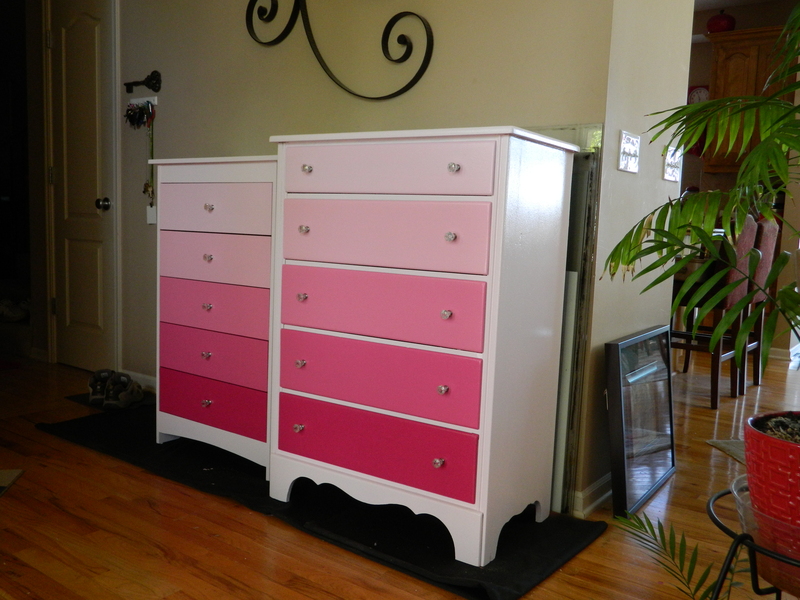 Pink, pink, PINK! 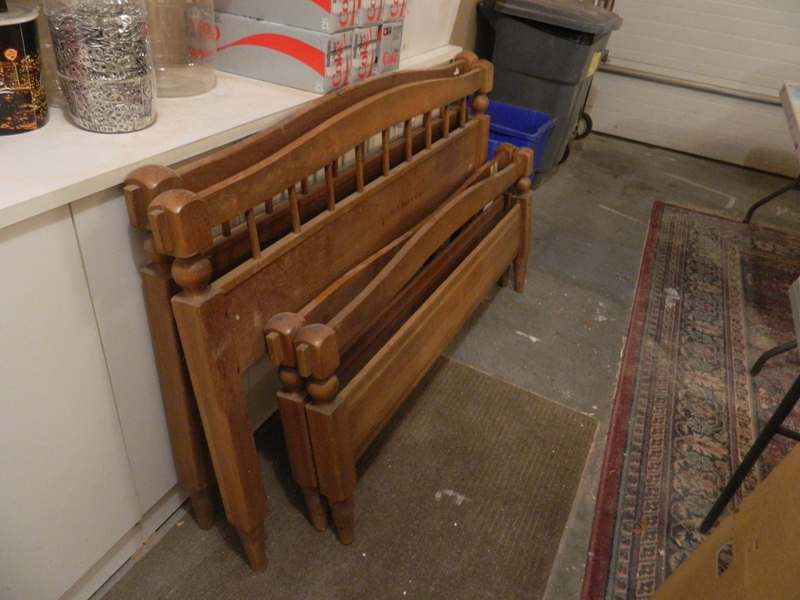 And… we’ve been working on turning two pairs of head and foot boards into benches. We totally lost momentum last week, but now we have found a new push to getting them completed. I have been debating on whether or not to build a farmhouse style table and maybe add two ladderback chairs before selling. Haven’t quite decided. 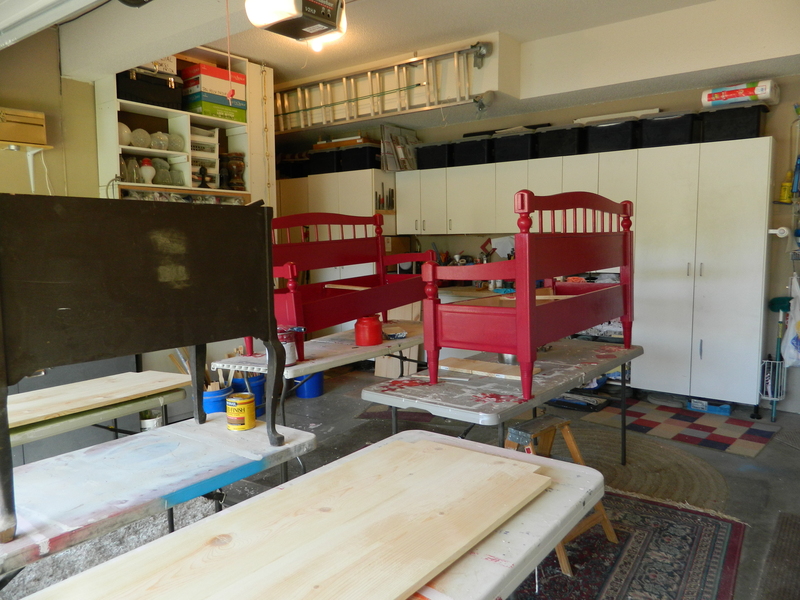 And speaking of undecided, we put the first coats of red on the benches. Holy cow! 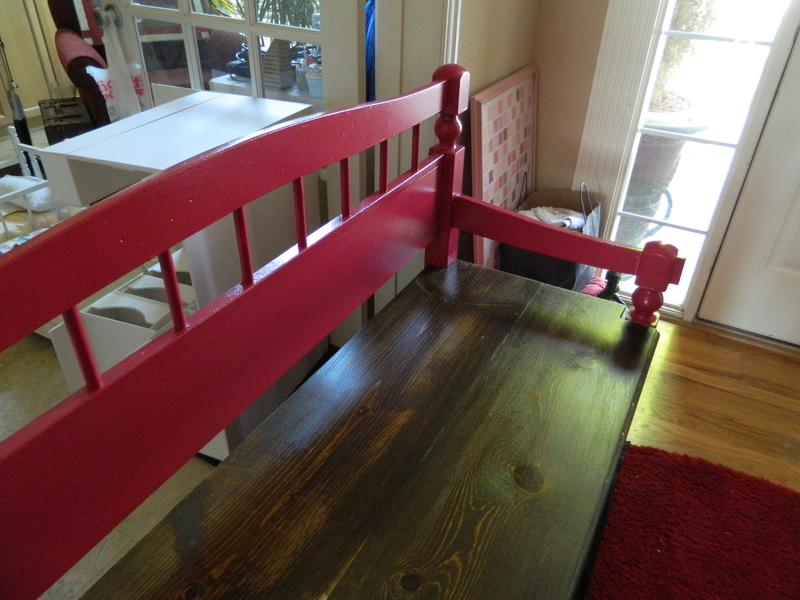 I don’t think this is the right red… it leans way too much to the pink spectrum that I am thinking a new deeper shade of red. I could have sworn that the paint was the same thing I used when painting my own pieces (you know that I love red, right?) but obviously it wasn’t. In fact, I started wondering where so many of my gallon paint cans came from… time to purge! Spent a bit of time working the cross stitch project too. Now that day light is around longer each night, it gives me more time to work on the project. For some reason, I cannot accurately do the stitches by lamp light, only day light. Totally weird, huh? I’ve just about made it through my list of started but unfinished projects. Crazy thing is, I don’t really have any new projects in mind! What ever will I do? Do you ever find yourself in one of those places? Where nothing seems to energize you or interest you or gets your creative juices going? That is where I have been for the last week. Scattered and wandering around aimless. 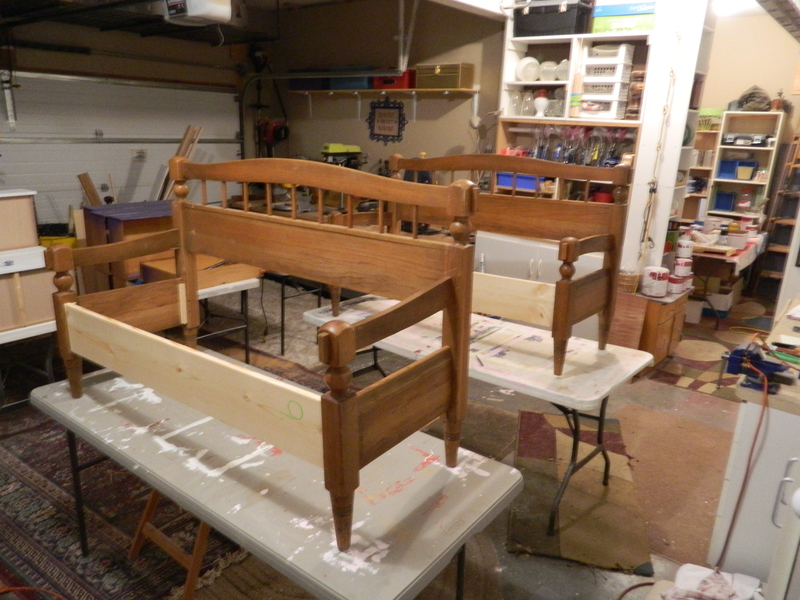 I have a number of projects in the works; the benches being constructed from head and foot boards, which I hope to pair with a long table and a couple of ladder back chairs. 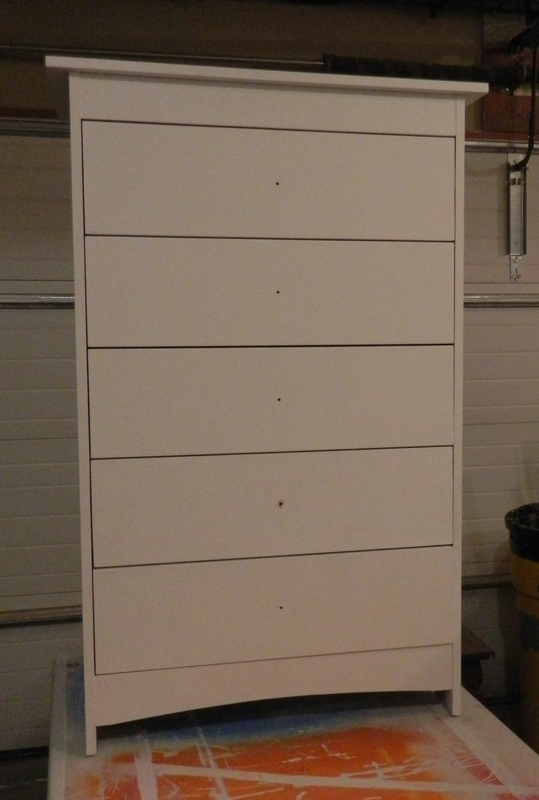 Next up, two more dressers awaiting priming and painting. Along with those larger projects, I am still working my giant cross stitch. I’ve been doing some purging in the meantime. I’ve listed a ton of my china collection on eBay. While trying to find a place for my latest collection (cut glass sugar bowls) I’ve realized that I am on the verge of becoming an honest-to-goodness hoarder. Only my hoard is for wonderful stuff (don’t they all say that?). Over the last ten years I have collected dinnerware that both my grandmothers had, my mother’s china and of course, my own china (you know, the good stuff that never is used). I collected cookie jars, cookie cutters, cake pans (these were more for making The Kid birthday cakes, but once you have them how can you get rid of them? ), buttons, beads, Lego mini-figs, PEZ dispensers (the count somewhere near a thousand), apples, old computers (with The Kid’s help), Monopoly tokens, Diet Coke stuff… heck, I could go on and on. Sometimes in this day and age of computers and eBay and Craigslist and other sites, collecting is so easy and what once starts as a harmless little collection soon becomes a huge pile. And then what do you do with it? Thanks for dropping by and I promise to have something good to share soon. Sometimes it seems that if I didn’t stay organized, I could easily be tempted to just kick back on the couch and watch streaming movies and work on my cross stitch. And speaking of, I have managed to get more completed – I figure I am about 30 – 35% completed. I have to make sure that I did a little work on it continuously, I don’t want it to go unfinished. 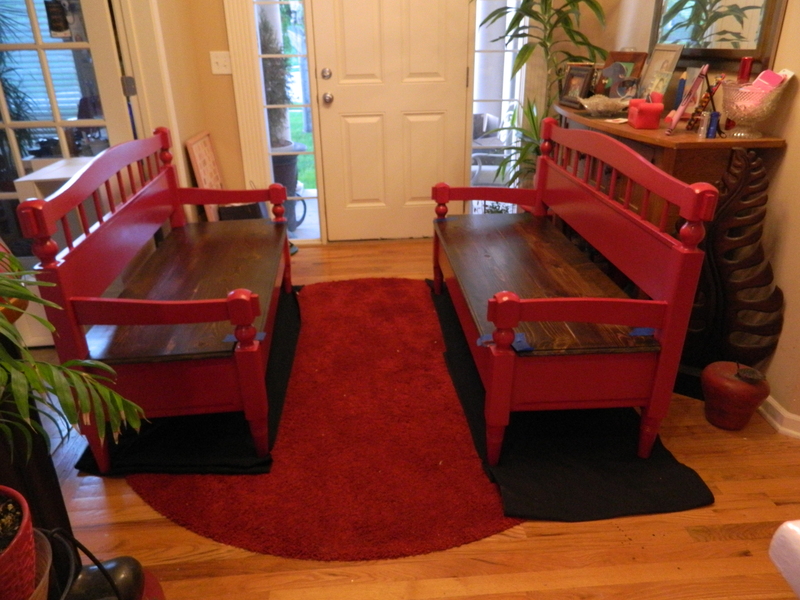 Today, The Kid and I worked on the head- and foot-boards, turning them into benches. 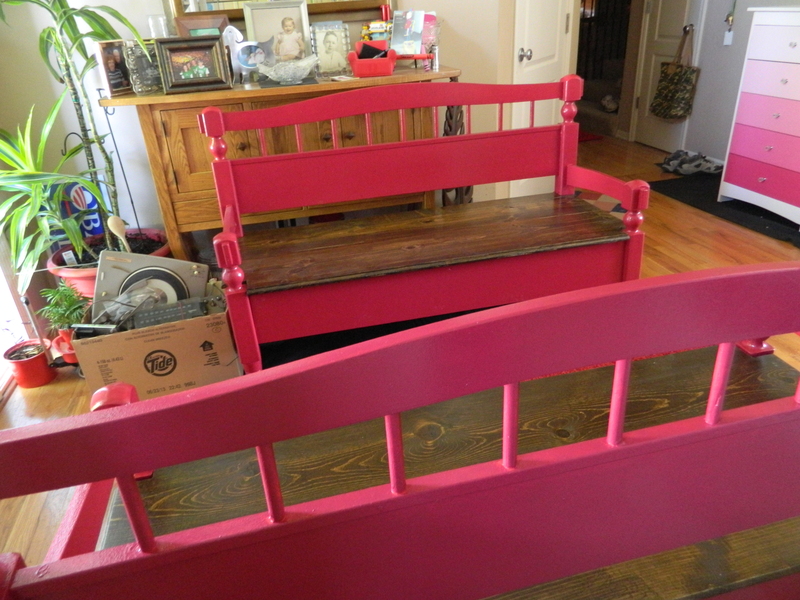 They are turning out pretty cool, although I am having some difficulty in figuring out what color to paint them. 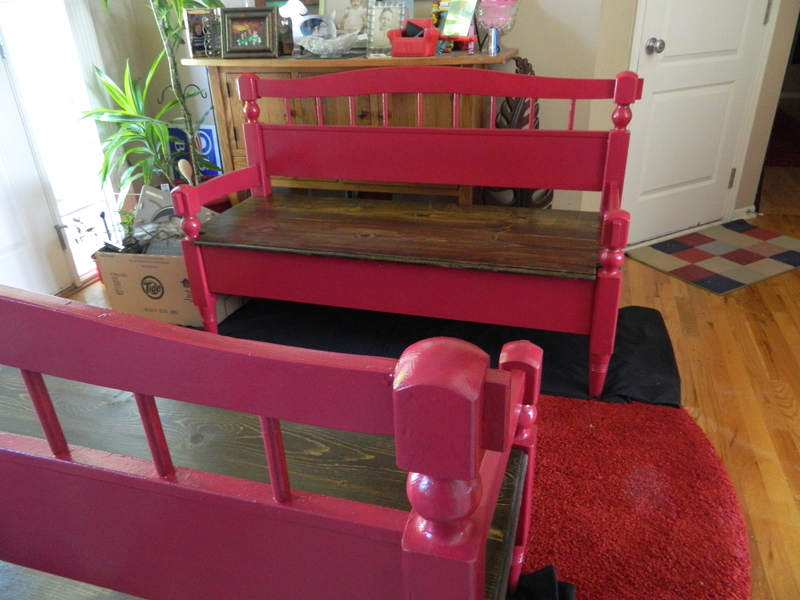 I briefly entertained the idea of sanding them down and refinishing them, but they have those round spindles and I don’t particularly enjoying sanding, staining or painting anything round… so, painting it is. I picked these up in an auction for a mere ten dollars. I totally could see the potential. I am now getting probably thirty or forty percent of my pieces through this auction business. I love working with The Kid. 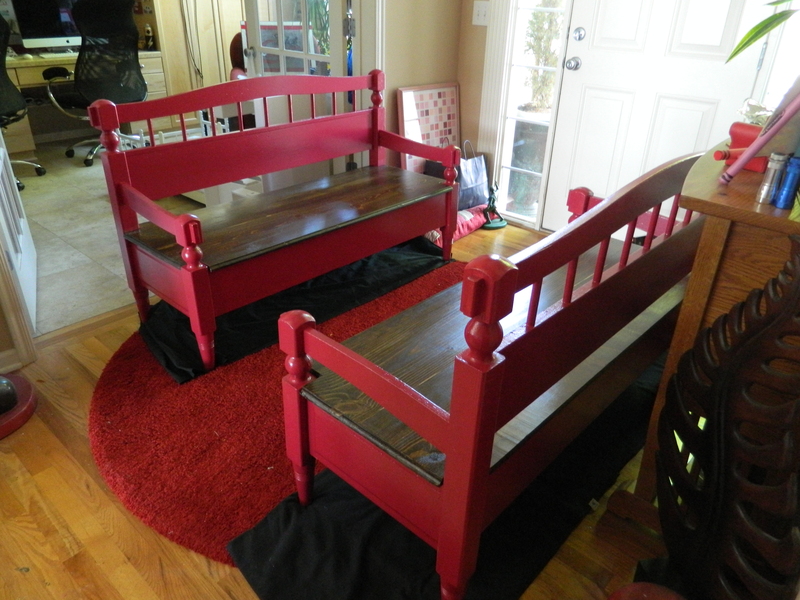 He is so talented when it comes to wood working and he has experience with all different tools. Thankfully, we continue to purchase better and new tools all the time; with funds from sales of finished products. 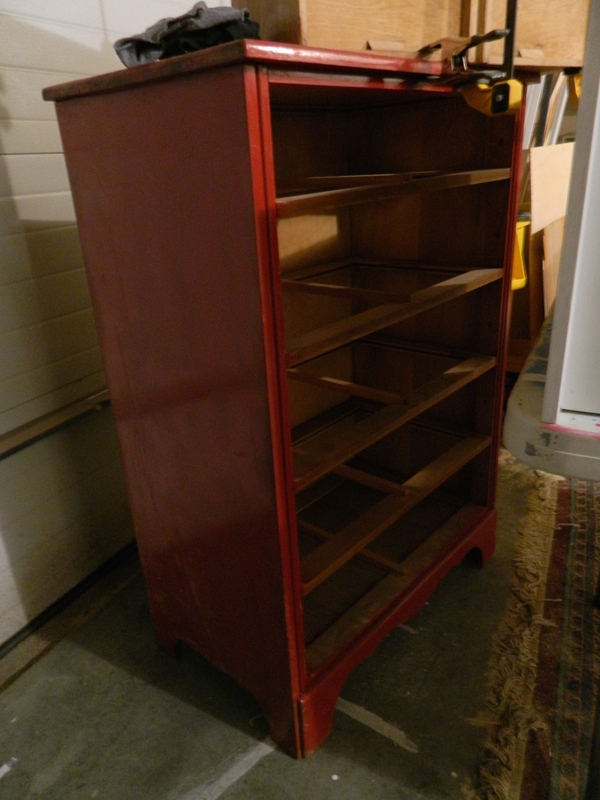 This piece is a very nice dresser purchased from the auction site. After we started taking the drawers out, we found that three out of the five drawers needed serious attention. 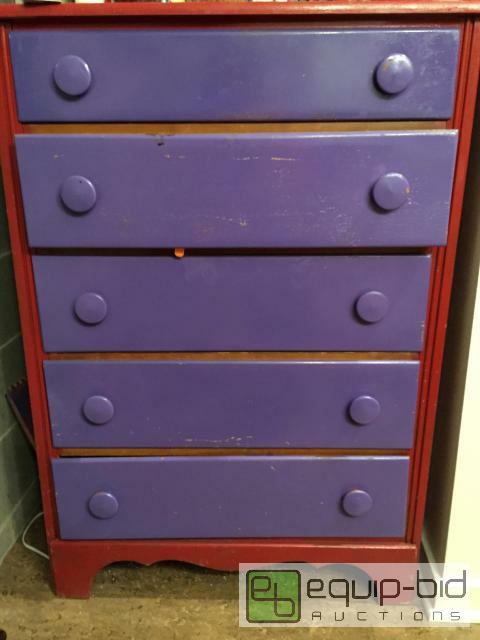 In fact, on the of the drawers actually came in five pieces; thankfully all of the pieces were there and in good shape, just a matter of gluing it all back together. 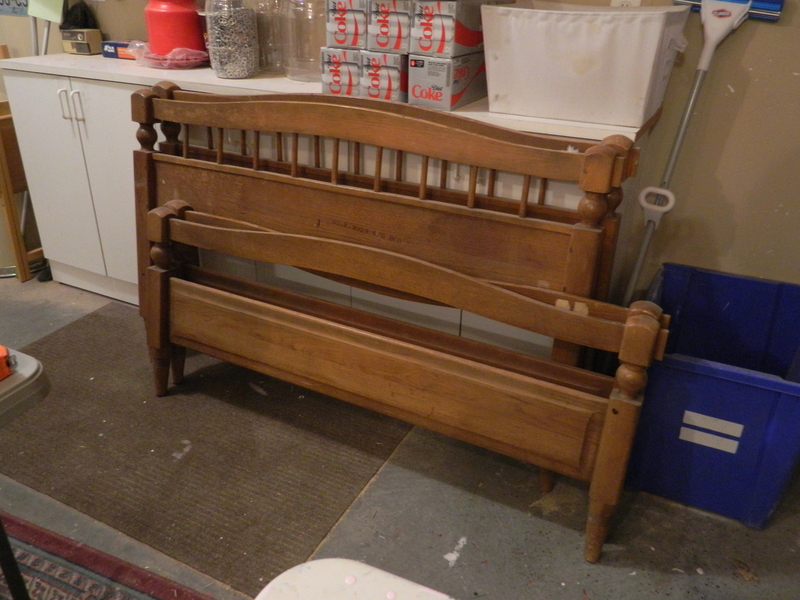 Tomorrow I get to start sanding. 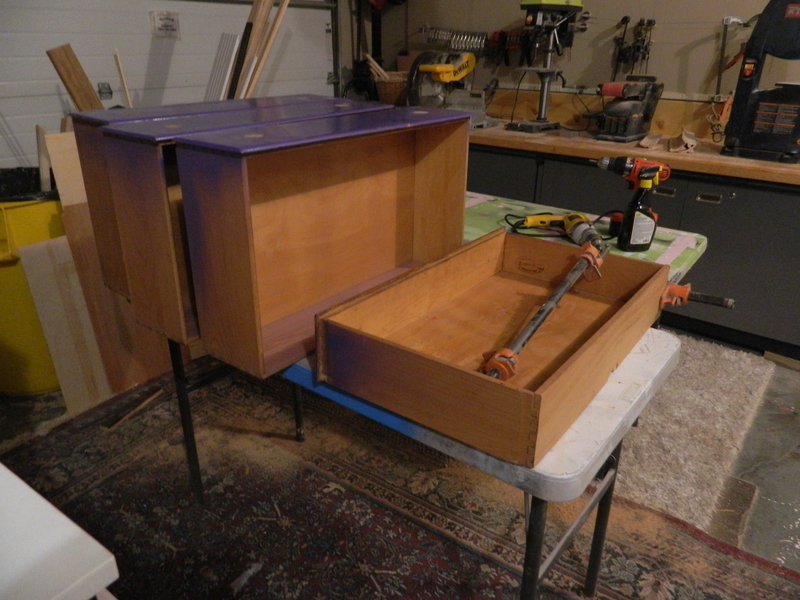 This purple paint on the cabinet and drawer fronts is peeling badly and I need to get all of that knocked down before I can start priming. 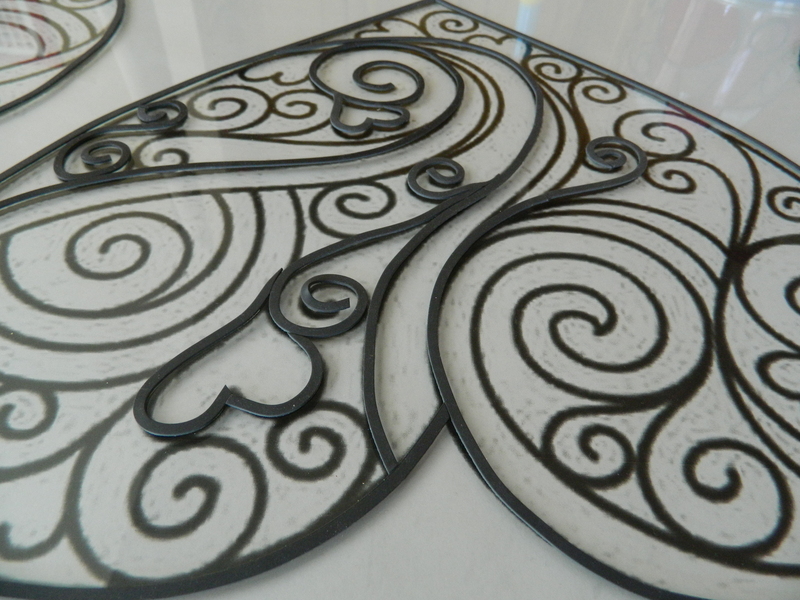 Another little project that I’ve been working on is another faux stained glass. I keep an eye out for interesting material; mirrors, glass, unique wood pieces, what have you. 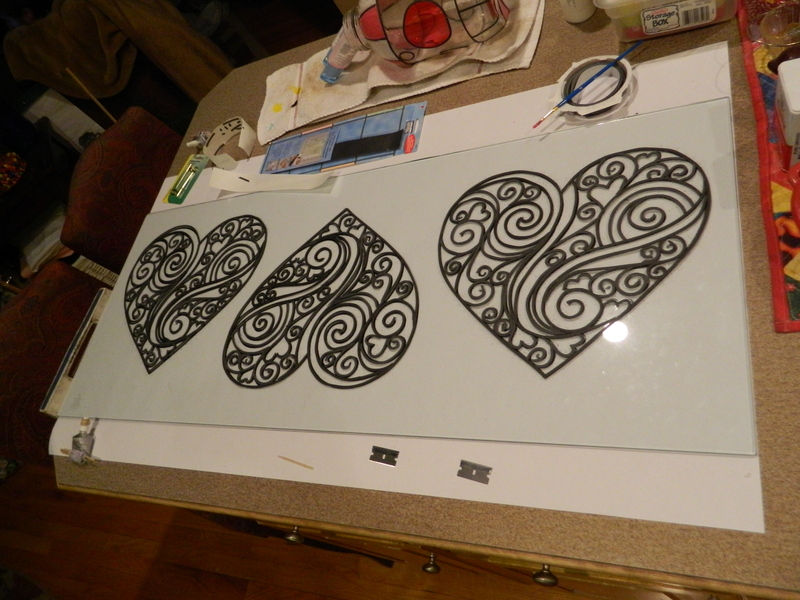 This project was a result of a large slab of glass I picked up. 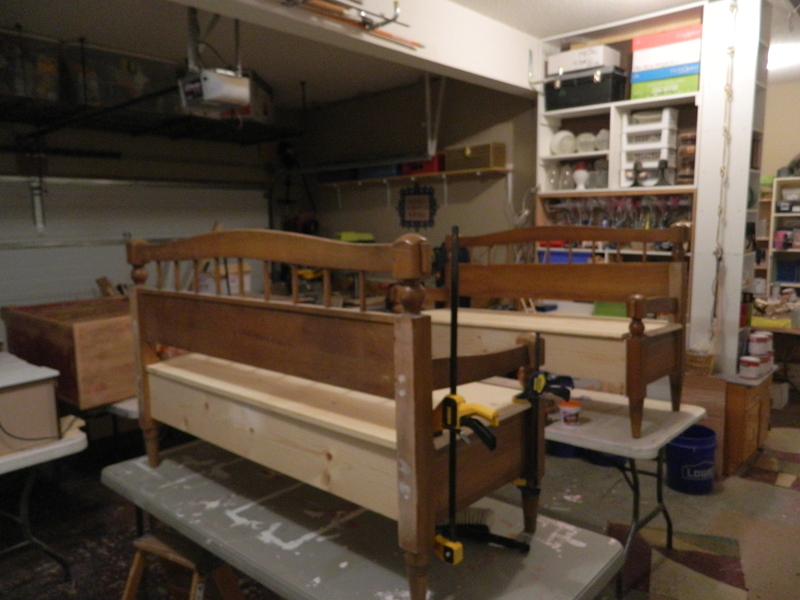 Then it was a matter of laying down the faux leading… this turned out to be a lot of exacting work. I made it a point to lay a few pieces every time I came into the kitchen. Finally! The leading is done. Whew! I thought I would know what colors I would want to finish this piece with by the time I got to this point, but I am conflicted on whether doing them all red or all pink. 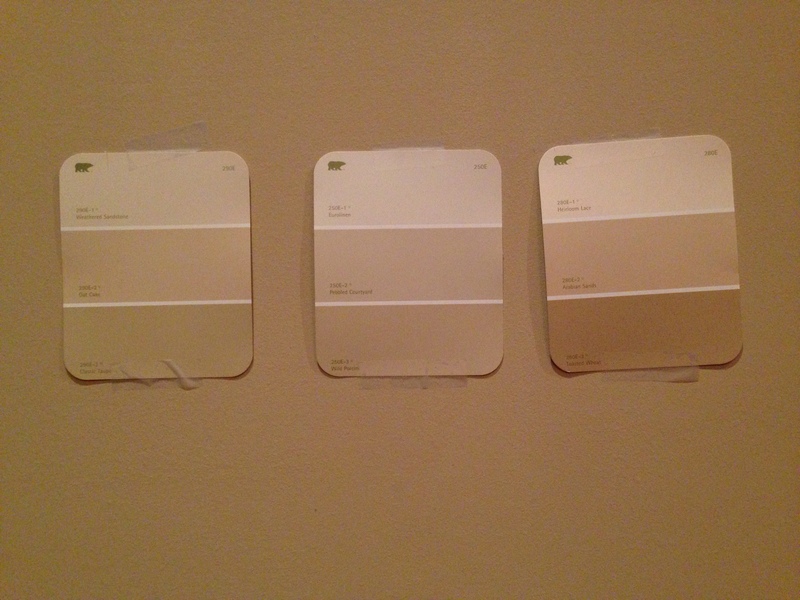 Or maybe one pink and one red and one white. 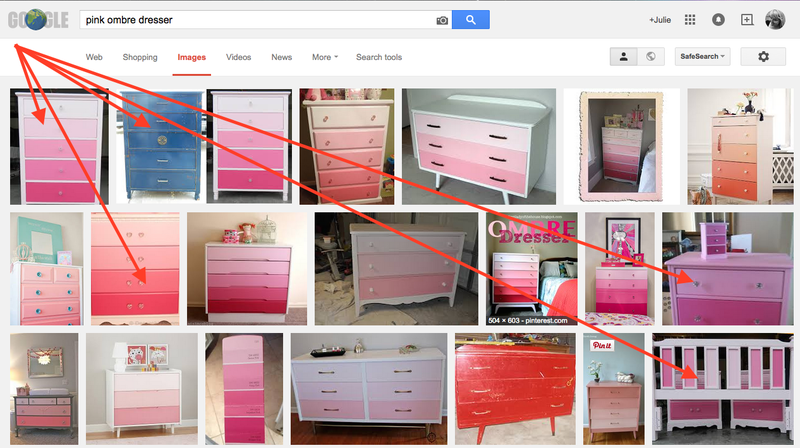 Perhaps two red and one pink? I am still thinking about it. 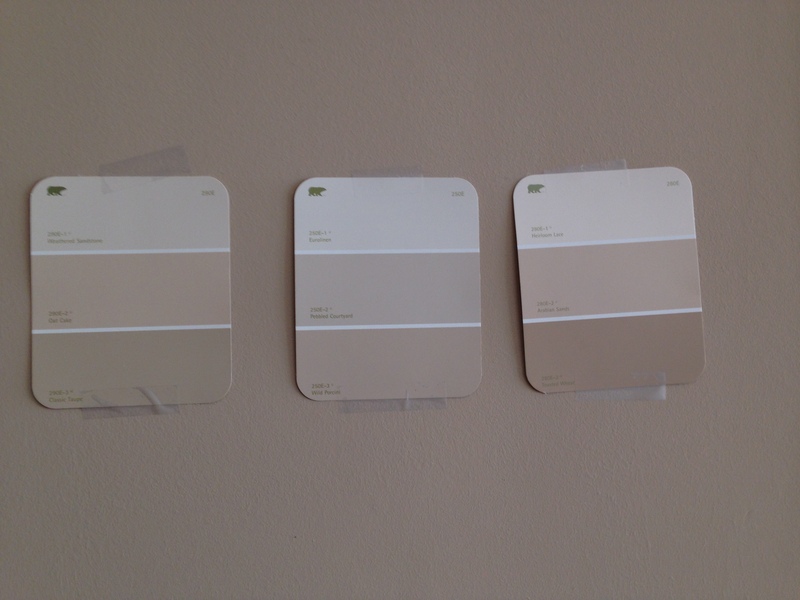 And speaking of colors, here is how the paint chip cards look in the morning light. While I was leaning to the left bottom color in evening light, this morning I am leaning towards the right middle color this morning. I am planning to just live with the chips for a while. Would love to hear your comments! Well, I need to update tomorrow’s list and get ready to hit the hay.